A great deal at Target… linen scarves about USD$13. Why wear a scarf when it’s warm out? They can dress up a no-tie look. And, a scarf is especially useful for your lady companion when you put the top down on the car, head out for an impromptu picnic, or that impulsive dash to the seashore on the first truly hot day. This entry was posted in Elegantology and tagged Jude Law, linen scarf, Target. Bookmark the permalink. We have been scarfing up all these sort of rustic, peasant day scarves around here. Not that I am not a huge collector of the ubiquitous silk foulard, but there is something sort of vagabond about a gauze, linen scarf. My new green scarf has the loveliest pom pom trim. Not crazy about this rustic looking remnant, but if worn, would look much better with an unconstructed beige or khaki linen or raw silk jacket, or Hemingway style safari jacket, rather than the finer, more formal dark jacket it is shown with. Agreed SwF. I went back and purchased a more refined version of linen scarf in grey with a proper fringed end. It’ll have to do until I find my navy spotted silk. 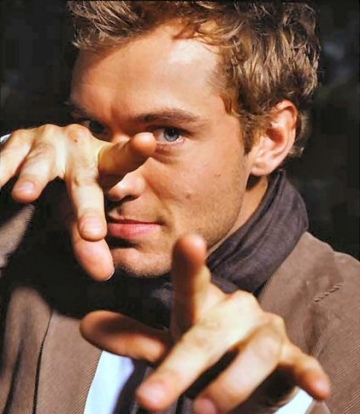 jude law is really a macho, hunk actor. my brother idolizes him-..